We provide drumming workshops for both children and adults. We offer one off drumming sessions at a venue of your choice or weekly courses. We also provide drum workshops and performances for fun days and community events. Henri Gaobi – Henri Gaobi has been drumming all his life. He has drummed with the best drummers of the African continent. 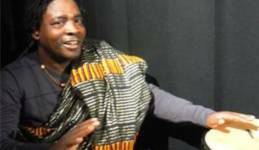 He is a brilliant and dedicated djembe drum tutor. His fantastic African rhythms inspire beginners and intermediates and professionals alike. To book for the next six week course contact us.